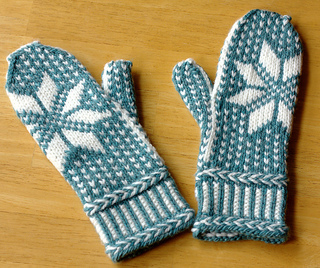 The Macro Mitts pattern now includes two sizes! 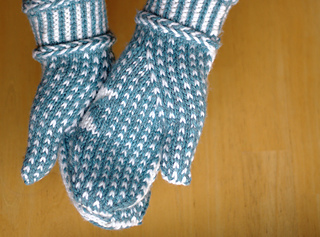 The Macro Mitts pattern has been test knitted and professionally edited. The pattern is a 7 page pdf including color photographs and charts. The charts are equally legible when printed in grayscale. 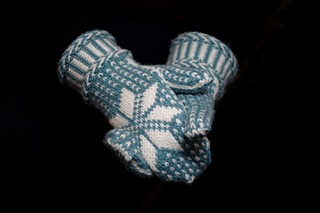 The Macro Mitts are knit stranded in two colors, featuring a large-scale graphic design of one magnified star, wrapping from the back of the hand onto the palm. The cuff is worked in sturdy corrugated ribbing, marked by Latvian braids on both ends. The thumbs are shaped with a gusset running along the curve of the palm for an extremely natural fit. knitting in the round, knitting with two colors, Latvian braid, reading a chart, increasing, decreasing, Kitchener stitch, picking up stitches. The pattern is written in two sizes: small (red and gray) and large (blue and white). 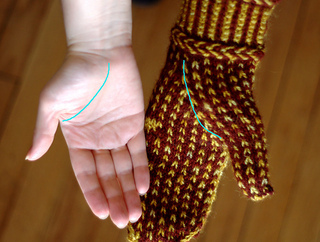 The difference between the two sizes is achieved by adjusting gauge through changes in both needle size and yarn weight. 5.5 (5) sts, and 5.5 (5) rnds per inch in colorwork pattern in the round. Adjust needle size as necessary to achieve correct gauge. for small mittens: Manos Rittenhouse Merino 5-ply (100% Merino Wool; 241 yds/100g) in colors Brick 554 (Red/MC), 1 skein, and Nickel 531 (Gray/CC), 1 skein. for large mittens: Cascade 128 Superwash Chunky (100% Superwash Merino Wool; 128yds/100g) in colors Summer Sky Heather 1910 (Blue/MC), 1 skein, and White 871 (White/CC), 1 skein. Needles: 8 (9) US needles, or size needed to get correct gauge. Pattern may be knit on double-pointed or circular needles. 1 stitch marker, stitch holder or waste yarn, tapestry needle.